The Sharp FV610 is a dual conversion, superheterodyne portable receiver covering long wave, medium wave, seven shortwave bands and FM. 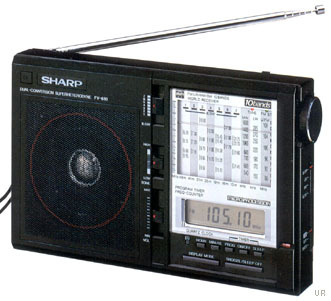 This radio features both an analog and a digital display. 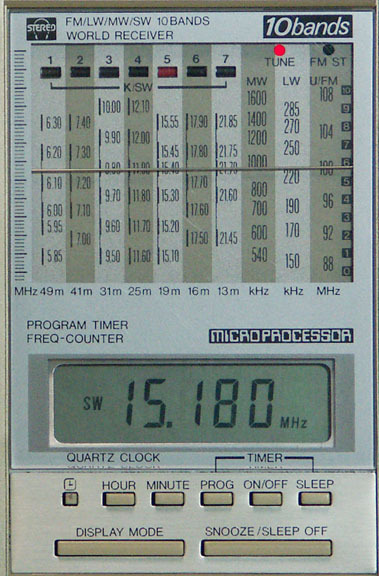 Shortwave coverage is: 5850-6350, 6950-7450, 9500-10000, 11600-12100, 15100-15600, 17450-17950 and 21400-21900 kHz. The LCD digital display gives precise station frequency and accurate 12/24 hour quartz time. FM stereo is provided to the earphone jack. A 3.125 inch speaker is featured. The digital clock includes a Snooze feature. There is a tune LED and an FM Stereo LED. Size: 8.25 x 5.35 x 1.675 inches 1.54 lbs. (210x135x42 mm 0.7 kg). This radio was produced with a black cabinet and a titanium-gold cabinet. This radio requires five AA cells and two SR44 button cells (not supplied). With wrist strap. Produced in both black and gold-beige versions.